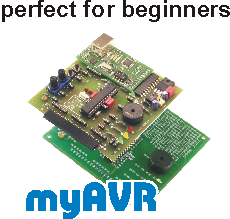 With these description it's easy to assemble your myAVR Board light. In this document you will find the assembly diagram and also a description about the procedure. New: the board is´equipped with smd components. The documents are adepted. The myUSBtoUART provides a virtual COM port for communi-cation between the PC and the micro-controller. This is done by using a CP2102 controller of the company SILABS. This module is very compact. The connection to the PC using a mini-USB port. Output side, RXD and TXD, CTS and RTS, as well as voltage (5V) and mass are available. This document include the importent properties and also the technical and mechanical data. The USB-SP12-programmer is an adapter to the USB programmer "mySmartUSB MK2", with help of this you can communicate with an SP12 compatible parallel programmer by USB. The USB-RS232-bridge is an adapter to the mySmartUSB MK2. With help of this you can extend your computer at a serial interface (Com-Port, RS232) or rather you can communicate with a RS232-device about a USB-interface. With the "externPowerKit" you can equip an available PCB for the power supply. This document contains the bill of material, the ciruit diagramm, technical data and details for the equipment. 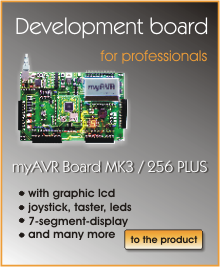 The myAVR Board MK2 USB is equipped with a RISC AVR microcontroller (ATmega8) from ATMEL. An USB programmer and a communication-port are integrated on the board. The intended controllers for the board belong to the MEGA-AVRs. You can connect Add-Ons to the myAVR Board over a pin header. The myAVR Board MK2 is equipped with a RISC AVR-microcontroller (ATmega8) from ATMEL. An USB programmer and a communication-port are integrated on the board. The system is designed for education and private study. The description contains a general description to the board, technical and mechanical data, circuit diagram, assembly diagram and notes for the optional placement.